One of the first duties of winter has been to organize, straigten up and clear out my Darkroom (now gun room and storage), projection room, (now storage and music room) and my office!!! Mostly it means getting rid of everthing I don’t use, need or want, and turst me, it has been many, many leaf bags of junk! In the process I’ve organized and stored all my shooting gear for the winter. I started to shoot Fujifilm in 2012 so this winter is 6 years of shooting this system and I am starting to settle on my most used and still owned stuff! 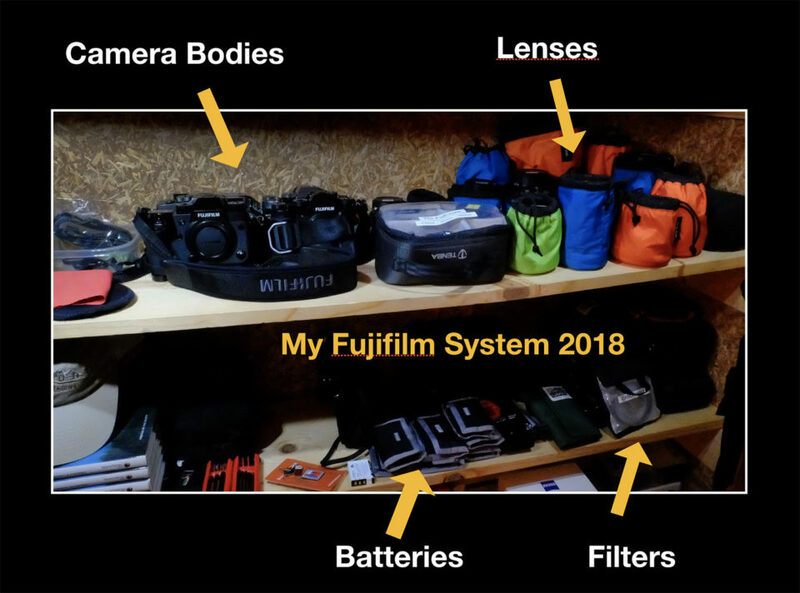 BODIES: I currently am shooting a Fujifilm X-H1, X-T2, X-PRO 2 nad still have a treasured Graphite X-T1. An X-T3 is on order. My light travel camera is a Fujifilm X30 * (used to shoot this photo) I still have my first Fujifilm camera the X10! LENSES: 8mm Rokinon Fisheye, Fujifilm; 14mm f 2.8, 10-24 f 4, 16mm f 1.4, 23mm f 1.4 7 23mm f 2, 27mm, 35mm f 2, 50mm f 2, 18-55 f 2.8-4, 18-135 f 3.5-5.6, 56mm f 1.2, 60mm Macro f 2.4, 55-200 f 3.5-4.5, 90mm f 2, 100-400 f 4.5-5.6, 1.4 Teleconverter, 2X Teleconverter, and a old classic Nikkor 200mm f 4, manual focus, micro lens. * You may notice that the 16-55 and 50-140 are missing. I had both and sold them because of their size and weight, I use the 100-400 as my long lens and found that even though the 50-140 is an incredible lens I wouldn’t carry both of them, one always stayed home and that one was the 50-140. I love the little 18-55 and prefer it for it’s size and it has IS, (Image Stabilization). BATTERIES: I currently have over 30 various batteries for my Fujifilm cameras. FILTERS: Polarizers to fit every lens, close up diopters and some additional ND filters. 5 Tripods: Yhough the only one I use on a regular basis is a TVC-3 X, Really Right Stuff with the BH55-LR ballhead. CAMERA BAGS & BACKPACKS: This is embarrassing especially considering I’ve reduced the number by 75% !!! 26 That’s wretched excess!!! Things I’m considering buying in 2019.: An X-T3 for sure, the new 16mm f 2.8. the new 16-80 f 4. Maybe the 80mm macro f 2.8. I loved the 200 f 2 but it’s out of my comfort range on price and probably too big for me to tavel with. Still thinking about the 8-14?????? Pretty big and it will be a bear to filter. So don’t know if that helps with any of your decisions, but that’s how it is for now! Hope you had a great Thanksgiving, we all have a lot to be thankful for. You may have heard that Wes has had a re-accurance of his lymphoma, but we caught it early and he is going back into chemo treatments tomorrow, your prayers pulled him through last time, I would covet them again for him and Rhonda and the family. God has it and we are confident it will be another victory!!! Thanks for your love and support! P.S. I was asked recently how we were holding up with this news on Wesley’s lymphoma. It’s simple, faith is believeing we serve a God that loves us more than we can understand, that He sacrificed His only Son for us. He has promised He will never allow anything to happen that is not for our ULTIMATE good, and He will be with us step by step through every trial. I’ve experienced that in my own life and seen it in others I love, and I refuse to not beleive it now! This life is only a boot camp for eternity! The best we can hope for is that we graduate having learned what we need to learn, and be prepared to spend eternity with Him. I rest everyday in that knowledge!!! I’m sorry to hear about Wes’s new challenge. We’ll keep him in our thoughts and prayers. Thanks for information on the equipment. Your equipment choices and thoughts on those choices will help me guide my efforts to keep my Gear Acquisition Syndrome in check. As for the bags, I understand. My more modest collection did not have the right bag as I went to some NPS programs over the weekend. All bags were either too large or too small. Maybe one day I’ll find the “right” bag. Bill, My prayers for an effective treatment and quick recovery for Wes. God’s love and strength to him and all your family. Thanks Rick, all is good, God has it! Prayers for Wes and all of you from Debbie and I.
Prayers for Wes. I currently have the 18-55, 16-55 and 18-135. Not to mention the 23/f2 and 35/f2 that I don’t seem to use very often. That seems like a lot of overlap. I tell myself I’ll keep the 16-55 for my more “serious work” when I have my tripod. But use the 18-55 for every day carry. But is it really that much better than the 18-55? I could sell it and the two primes and go on a nice trip. I still think the 18-135 has a place for me with the extra focal length and weather sealing (snow mobile rides, windy days on the beach with sand blowing everywhere, helicopter rides, etc). I sold the 16-55 because of size, weight and not having IS, now I have an X-H1 which would give IS back, but I still think the 18-55 znd 18-135 are plenty sharp. If I had the 16-55 I would own three lenses that essentially do the same thing! Love You Bill ! Our family will continue to pray for Wes ~ God is good and these current trails shall pass ~ Stay strong my friend! Thank you my friend, it)s our only choice! You expressed your view of God/trials/eternity well! Keep the Faith, my brother! You bet I will, and Happy Birthday a couple of days late! Linda and I are praying that Jehovah Shalom will fill Wes, his family, you, and Shirleen with a peace which surpasses all understanding. I have confidence in Him as healer, comforter,and provider if all you need. Blessings to you this Christmas. Thank you Casey, and same to you and yours! Prayers are offered for Wes and your family. Think of you often Bill and wish we could spend some time together. Life is so busy…….. Any chance you’ll be in Atlanta for IUSA in January??? God bless you all this Christmas season and always. We never walk alone! …….and I never run anymore!